Since the iPhone launch in October 2015, Swisscom has been using PeakProtect – the online waiting room solution developed by ELCA. PeakProtect prevents websites crashing due to excessive traffic and guarantees a faultless user experience every time. Each time Apple launches a new product the fans line up in front of stores and online. The extremely high online traffic from the moment that sales launch presents a challenge for all resellers: if the system fails due to several thousand requests per second, users will be dissatisfied and will possibly buy elsewhere. This scenario is highly likely considering that Apple hardly ever communicates the exact day and time of the launch. This represents a true challenge, which in turn intensifies the risk of unexpected peak loads. Swisscom was faced with this challenge, which would put high pressure on its customer service and IT departments and result in significant loss of revenue. Since the iPhone launch in October 2015, Swisscom uses PeakProtect, the online waiting room solution designed and implemented by ELCA to manage exceptional peaks of online traffic. With PeakProtect customers are guided into the purchsaing process in numerical order – just like in the queue at the post office. 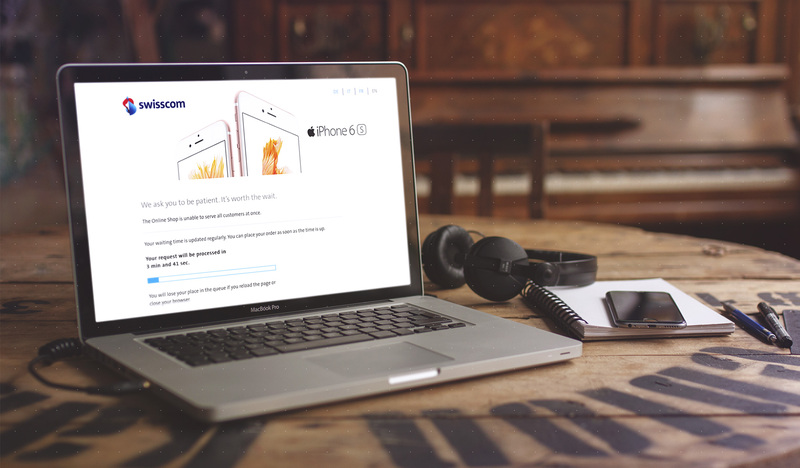 This means that the solution allows only the eligible number of customers to proceed with the purchase of their iPhone. Above-average levels of online users and buyers are redirected to a waiting page (that could also be used to deliver brand content). The buyers are informed of their place in the queue and how long they have to wait. They can focus on other things in the meantime, while being confident that their request is being processed even if they need to wait a bit. PeakProtect perfectly complements the company’s web presence visually. See the screenshot of the Swisscom website for the iPhone launch.